They didn't want to be on the boat in the first place. They were sent there as a character-building experience. But now that the adults are gone, the quest for survival has begun. This first book in a suspenseful survival trilogy delivers the gripping drama of people battling the elements to younger readers. I read this book aloud to my younger daughter, and we really enjoyed it! Personally, I love survival stories so this was right up my alley. 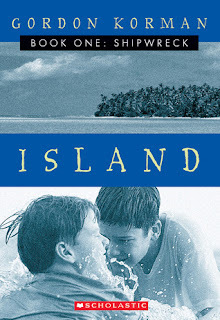 Six teens are thrown together for a one-month adventure at sea off the coast of Guam. To me, that sounds like a treat but it's not. The kids are taking part in a program called Charting a New Course designed as a punishment of sorts for wayward teens, where they learn discipline and teamwork and have no access to computers, the internet, iPhones, or any other electronic devices which is perhaps that worst part of the punishment for them! The most annoying kid in the group is J.J., who is the richest in the bunch and thinks the rules don't apply to him. Because of his stupidity, the Captain gets swept overboard during a storm. The sailboat takes on too much water and, despite tossing all non-essentials overboard, the boat is still slowly sinking. One morning, the kids awaken and discover that the first mate (and only adult remaining on board), Mr. Radford, has abandoned them. It appears that he has taken the boat's wooden dinghy and half of their food rations and decided to save himself rather than go down with the ship! The kids have a brilliant plan with pumping the water out of the engine room and taking the engine apart to let it dry and put it back together. The plan nearly works, but there is an explosion that blasts three of the kids overboard and sets the ship on fire. The book ends on a cliffhanger, and two of the kids are MIA. We don't know whether they have drowned or if they survived, but the sextet is split up for the time being. Hopefully, they will find each other. I love Luke, who has become like a leader to the group. He has a good head on his shoulders, and he cares for others. When he was thrown overboard and managed to cling to a part of the ship that kept him afloat, he didn't think twice about jumping back into the turbulent sea to save one of the other kids who was too weak to tread water and was ready to go under. Ian is another kid that I admire. He's very intelligent and is one of those people that can remember everything they watch or read, and some of that knowledge that is filed away in his brain proves to be very useful! I can't believe that Radford was so selfish that he left those kids to fend for themselves! How shameful!! I don't know how anyone could do that, to leave six children to drown. I'm still holding out hope that somehow the Captain has survived, fingers crossed! Korman is a new-to-me author, and I'm definitely buying more of his books! I love the fast pace of this story, and it was one of those books that I was tempted to read ahead after I put my daughter to bed, LOL! I can't wait to continue with the next book in the series, Survival. 4 stars!! It was really good, and you should put it on your TBR list if you enjoy middle grade survival stories.